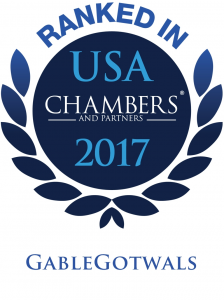 Sixteen GableGotwals attorneys have also been named as ‘Leaders in their Field’ in the 2016 Chambers USA rankings. Areas of law ranked include Corporate Commercial: Health Care, Energy & Natural Resources, Intellectual Property, Litigation, Native American Law and Real Estate. What the team is known for: Over 60 years’ experience in the handling of oil and gas-related issues, not only in Oklahoma, but also in Texas and Kansas, providing both litigation services and specialist support on transactions. Also offers niche expertise concerning title examinations, royalty disputes and regulatory compliance issues, particularly those involving fracking operations or matters considered by the Oklahoma Corporation Commission. Work highlights: Acted successfully for exploration and production company Helmerich & Payne in an Oklahoma Supreme Court appellate case which rejected the claims of a class of royalty owners to $50 million in interest payments allegedly due under the provisions of the state’s Production Revenue Standards Act. Of counsel Lloyd Landreth is a “fantastic environmental lawyer,” cited by sources for his “very deep background in both regulatory work and hands-on environmental issues.” His expertise is sought out by clients from the oil and gas, aviation and waste disposal sectors and embraces experience of dealings with federal and state regulatory bodies across the nation. Steven Adams “is known as an excellent litigator” of energy and resources matters and is active on cases – including class actions – arising out of both transactional and environment-related disputes. He brings to his work valuable perspectives acquired during a period of service as an Oklahoma District Court judge. Dale Cottingham focuses on energy sector disputes, particularly those with environmental or regulatory aspects, including matters overseen by the Oklahoma Corporation Commission. His expertise in water-related issues is highlighted by peers, while his litigation skills receive high praise from a client. Richard Noulles is an “excellent oil and gas litigator” with “a very good reputation” in this space, particularly where class actions, title disputes and state severance tax issues are concerned. He lately played a key role in GableGotwals’s successful representation of Helmerich & Payne in an Oklahoma Supreme Court royalty class action appellate case. Terry Ragsdale draws on experience as a petroleum engineer in the 1980s, combined with 25 years’ experience as a GableGotwals attorney, to advise clients from all branches of the energy sector across an exhaustive range of contentious and transactional issues. He lately acted successfully for Eagle Rock Energy Partners in an Oklahoma Supreme Court consideration of a dispute with In American Natural Resources and is accounted “an excellent lawyer” by his peers. Rob Robertson enjoys a high reputation for his representation of energy companies in purchase and sale agreement, royalty class action and utility ratemaking disputes. He recently co-led the successful defense of a leading energy company in a qui tam case with over $10 million at stake. What the team is known for: Full-service dispute resolution offering, including the handling of appellate cases to US Supreme Court level, arbitration and mediation, acting for Oklahoma-based clients across the country and national companies with Oklahoman interests. Maintains key strengths in oil and gas royalty and class action, construction, financial services and product liability issues and further noted for its electronic discovery expertise. Work highlights: Represented BridgeTex Pipeline in Texas district court proceedings concerning the client’s claim that Stampede Energy owed it $279 million for the alleged breach of an agreement to supply BridgeTex with a given quantity of crude oil. Acted successfully in defense of a client in US District Court for the Western District of Oklahoma proceedings which brought an end to a four-year dispute. The plaintiffs’ claims were dismissed with prejudice and they were also sanctioned for discovery misconduct and required to pay all the associated fees and costs. James Sturdivant is noted for the formidable litigation skills that he has deployed in more than 100 trials in over 50 years’ practice at GableGotwals. He remains on hand to advise on a range of antitrust, energy or securities matters as well as numerous commercial disputes. David Bryant regularly handles high-value energy-related matters in both Oklahoma and Texas, lately acting for BridgeTex Pipeline in a $279 million dispute with Stampede Energy. Identified by peers as a choice for referrals, he is also notably active in the insurance and environmental spaces. Oliver Howard is hailed by peers as an “exceptionally talented attorney with lots of experience” who is “very good, both with juries and with opposing counsel.” His deep knowledge of the energy and environmental fields has been applied to cases in more than 20 states. Sidney Dunagan specializes in product liability issues in the aviation and construction spheres, but his litigation experience, which now extends back over 50 years, also covers frequent involvement with energy, environmental and professional liability matters. David Keglovits enters the rankings with the support of praise from both clients and peers, one of the former calling him “our go-to guy for litigation” while one of the latter states: “I’ve been impressed by his talent and ability: he’s outstanding – a very fine lawyer.” His expertise covers a broad commercial range which incorporates strengths in such areas as construction, energy, insurance and Native American Law. Dean Luthey is a “well known and well regarded” litigator. Noted for his knowledge of Indian and gaming law, he is equally at home handling energy, securities and a variety of other dispute types. He lately played a key role in a business bankruptcy case, helping to have a tort judgment imposed on a client reduced on appeal. Robert Glass enjoys widespread respect as a highly active and accomplished attorney whom peers recommend for his expertise in transactional, regulatory and contentious healthcare matters. He acts as general counsel to a number of medical institutions, including the St. John Health System in Tulsa. The firm is classed as a “Other Noted Firm”. Dean Luthey of GableGotwals in Tulsa is “very well regarded” in this sphere, particularly for his work in the area where questions of gaming and Indian law overlap. Also active on a wide range of contentious issues, he served as a member of a team acting for the Cherokee Nation attorney general in an adoption case involving a challenge to the provisions of the Oklahoma Indian Child Welfare Act. Stephen Schuller of GableGotwals is praised as a “very good real estate lawyer who handles a lot of zoning and land use” matters. He represents developers and investors including foreign corporations in securing approval for the construction of a range of properties. He is also skilled in assisting with real estate acquisitions and financings. Todd Nelson of GableGotwals covers both transactional and contentious issues involving copyrights, patents, trademarks and trade secrets, one interviewee stressing that he is “particularly good on litigation in the trademark and patent areas.” An experienced handler of cases in the courts of 12 states, he is especially familiar with issues involving automotive, recreational and food-related technologies.